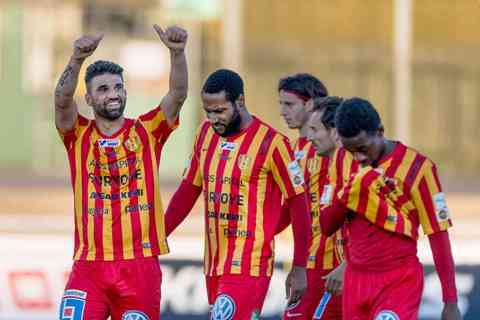 Syrianska – Norrby predictions for Sweden Superettan match at Sodertalje Fotbollsarena, Stockholm County. The team’s strength is equal . Read on for live streaming info and our free predictions. Do you want to watch live streaming of Syrianska – Norrby bet live? Go to bet365 Live Streaming and place winning bets! With 18 points both clubs are in risk zone so it will be a six-pointer. Syrianska look unstable, the team could not win two consecutive games this season and this fact is enough to choose a bet for today, because in the last round they managed to take three points, which means that they can not count on another victory in this round. Syrianska have only five wins, four of which were against other outsiders and only one was took against the mid-table Orgryte. Of course, Norrby can also be classified as an outsider, but the guests are in good form at the moment as they managed to beat strong Helsingborg at the weekend. In the previous three home matches the Syrians have conceded 9 goals and with such difficulties in the defence line they will have problems with Norrby, which look quite confident in their offensive line. The summer break seems to have benefited the guests, in the last round they demonstrated a good football and deservedly took three points against one of the league leaders. However, it is unlikely that they will be able to record a second away victory this season, as Blue-and-white are the worst away team of the league at the moment – Norrby have lost all games on the road except one. Nevertheless, today’s rival is in the guests’ power and, most likely, they will not lose. Draw will be a smart choice.